Medial collateral ligament (MCL) knee sprains are common injuries in which the ligament on the inside of the knee is torn. These sprains most often occur in sports such as soccer, football, and rugby, but they can happen off the playing field as well. Any direct blow to the knee — most often from falls and twists — can result in a MCL sprain. There are several ways to identify and treat a MCL knee injury, and following a few simple preventive steps could save you from the pain a knee injury causes. Grade 1﻿. This categorizes mild injuries, which normally take about two weeks to heal. Tenderness on the inside of the knee and little-to-no swelling are typically symptomatic of this low level MCL knee sprain. Grade 2. Moderate knee ligament injuries fall under this category and can take about a month to heal. Symptoms of this level of sprain include extreme sensitivity on the inside of the knee and overall knee swelling. Grade 3. This grade signifies a complete ligament tear and can take up to six months to heal. Pain can vary in this stage. A wobbly or unstable feeling in the knee is one of the more telling symptoms of a complete tear. Warm up properly before exercise. Avoid activities that may cause pain or injury. Rest and allow the body’s soft tissues to recover from strenuous activity. Incorporate balancing exercises into your routine. Stretch each morning and after strenuous exercise. Perform strengthening exercises that target the major muscles and tendons located around the knee joint. Wrap or tape a weak knee before exercise. Wear a knee brace if necessary. If you suffer a MCL knee sprain, visit the medical professionals at FastMed Urgent Care for treatment that is caring, affordable, and fast. We are ready to handle any of your immediate medical needs. 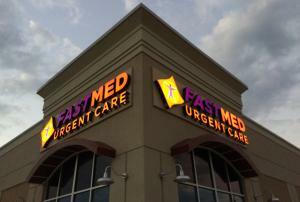 We have X-rays and on-site labs for any diagnostic needs, and at FastMed Urgent Care, you never need an appointment. We accept all major insurance plans, including Medicare and Medicaid so check out our Insurance page to confirm that your plan is accepted before coming in for MCL knee sprain treatment.